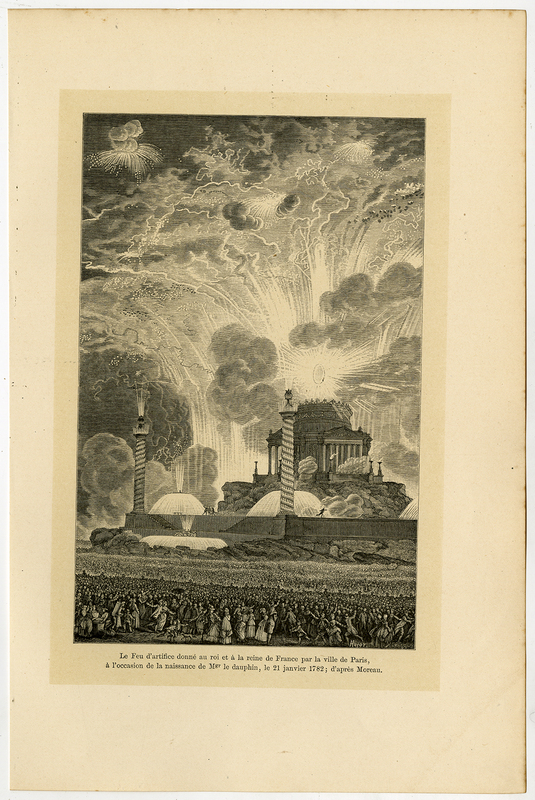 Subject: Plate: ''Le feu d''artifice donne au roi et a la reine de France ...'' (Fireworks for the King and Queen of France by the city of Paris in 1782). After Moreau le Jeune. Medium: Lithograph and wood engraving on a vellin type paper. Size (in cm): The overall size is ca. 18.3 x 27.9 cm. The image size is ca. 12.2 x 19.8 cm. Size (in inch): The overall size is ca. 7.2 x 11 inch. The image size is ca. 4.8 x 7.8 inch. Description: This attractive original old antique print / plate originates from: 'XVIIIme Siecle. Lettres Sciences et Arts. France 1700-1789.' (Science and art of France during the 18th c. until 1789). ), by Paul Lacroix, published in Paris by Firmin-Didot et Cie., 1878. This plate by Huyot.